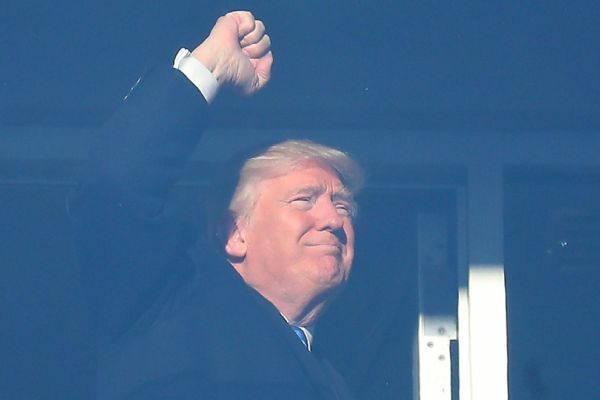 BALTIMORE -- Donald Trump was greeted with cheers upon his arrival at the annual Army-Navy game on Saturday, basking in the one of the nation's most storied football rivalries as he prepares to enter the White House. In an interview with CBS Sports announcers Verne Lundquist and Gary Danielson, Trump said he was "totally neutral" on the outcome of the game and quipped that he might make Lundquist, who was retiring from the play-by-play booth, his ambassador to Sweden. "I just love the armed forces, love the folks," Trump said. "The spirit is so incredible. I mean, I don't know if it's necessarily the best football, but it's very good. But, boy, do they have spirit." Navy had won 14 straight contests in the rivalry, but Army's underdog Black Knights prevailed 21-17, in a fourth-quarter comeback that came weeks after Trump's stunning victory over Hillary Clinton. Trump spent the first half of the game in the box of David Urban, a West Point graduate and one of his Republican advisers in battleground Pennsylvania, and the second half in the box of retired Marine Lt. Col. Oliver North, a graduate of Annapolis. Trump did not formally switch sides at halftime in the traditional symbol of commander in chief neutrality -- which President Barack Obama did most recently during the 2011 game -- because Trump is not the sitting president. The incoming president is a 1964 graduate of the New York Military Academy, a private prep school near West Point. Trump's appearance at the football game capped off a week of rolling out Cabinet picks, holding "thank you" rallies in North Carolina, Iowa and Michigan, and trying to cement his incoming Senate majority with Saturday's runoff election in Louisiana. After beating Navy for the first time since 2001, the Black Knights faithful storm the field at M&T Bank Stadium.